The food discussion in America can be quite pessimistic. With high obesity rates, diabetes, climate change, environmental degradation, and common occurrence of animal abuse in factory farms, it would seem that there wasn't very much room for a positive perspective. The constant fear that there just isn't enough food has expanded to new areas of concern about water availability, rising health care costs, and dying bees. 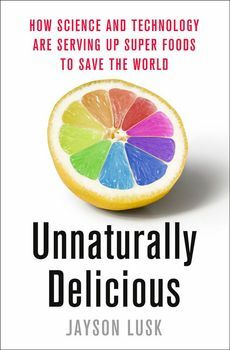 In Unnaturally Delicious, Lusk makes room for a positive perspective by writing the story of the changing food system, suggesting that technology and agriculture can work together in a healthy and innovative way to help solve the world's largest food issues and improve the farming system as we know it. There is a new kind of farmer and a new kind of food consumer - Food Techies. Food Techies are changing food and agriculture for the good, and these changes can help solve some of the most serious food issues plaguing our world. Innovation is the American way. Benjamin Franklin, Thomas Jefferson, and many of America's forefathers saw innovation and change as necessary for creating a strong nation. Now the world is filled with convenient innovations that change the way we think about food. These innovations, however, come with their own set of new challenges. Who are the scientists, entrepreneurs, and progressive farmers who meet these challenges and search for solutions? Unnaturally Delicious has the answers. An alternative vision of food's future, from how technology is changing the way we think about food to how a new breed of farmer and food consumer is solving the biggest food problems of our time.